Several of my friends planned to walk in the spring of 2013 along the Camino Santiago pilgrimage trail from Saint Jean-de-Luz in France to Santiago de Compostela in Spain. 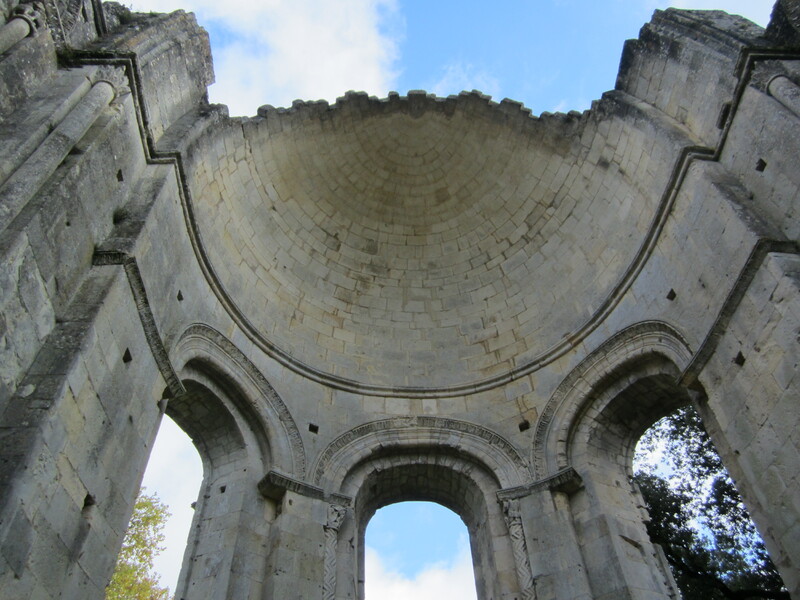 Bill and I decided to honor that endeavor by visiting the UNESCO World Heritage site at the Abbaye de la Sauve-Majeure, an important religious center built in the 12th century. 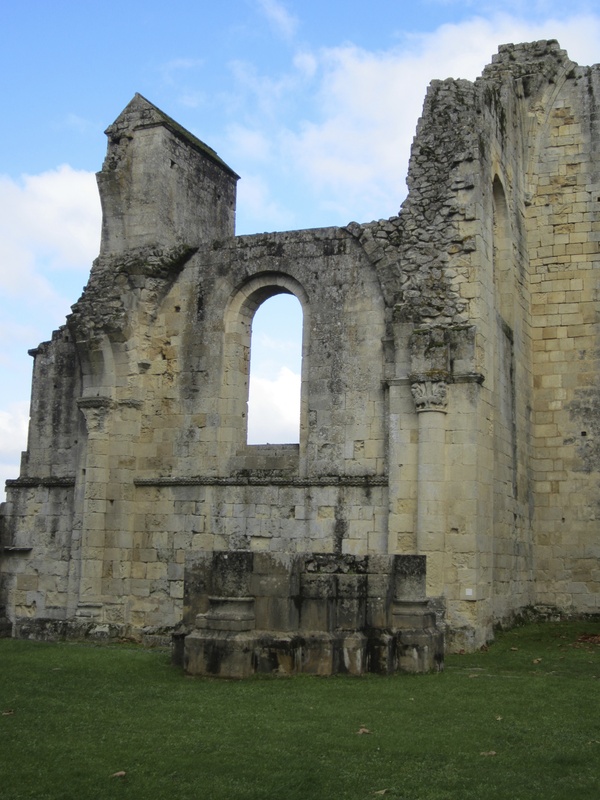 Located near the original Camino Santiago route, the abbey was a twenty-minute drive from our lodging at the Château de Crécy in Romagne. The day promised to be bright and sunny with just a chance of scattered showers. Perfect for a ramble in the countryside! Situated at the entrance to the abbey we found a Maison des Vins, or tasting room for wines of the Entre-Deux-Mers appellation. The name of this appellation comes from the region between the Dordogne and Garonne rivers in the beautiful countryside of Aquitaine. During a previous trip to Bordeaux, we enjoyed these very fine wines with several meals. We found the white wines to be sublime when paired with salmon and other seafood dishes. Unfortunately, wines from this region seem to be elusive at our local wine stores, so we were ecstatic to have the opportunity to taste and buy a few bottles. The manager of the tasting room explained that she was just closing for lunch, so we pledged to return after our visit to the abbey and church. For the next couple of hours, we toured the grounds. Built as a Benedictine abbey, the site served as a welcome place of rest for pilgrims walking from northern France to Spain. Within the property are the crumbling remains of the church, scriptorium and refectory. The outlines of the chapter house and cloister are visible although the buildings are long gone. 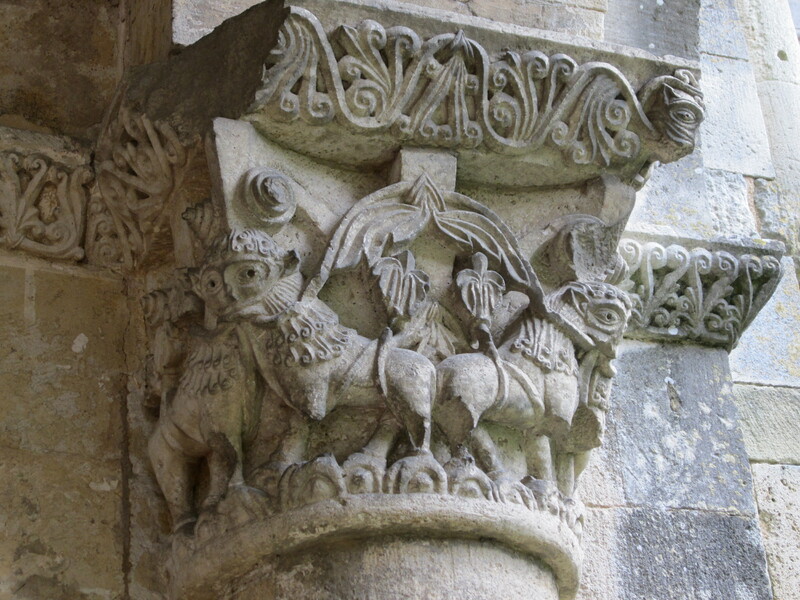 Throughout the ruins of the Romanesque style church one can still find stone carvings that depict scenes from the bible such as “Daniel in the Lion’s Den” and “The Life of Samson.” At a time when only the clergy and some nobles were literate, the graphic sculptures provided a way to instruct the faithful about the mysteries and traditions of their religion. I was struck by the clarity of the messages created by those craftsmen of long ago. During visits to other churches throughout Europe, we have noted the similarities in the way that the stories of the bible are shown. One can see that during the age of faith, there was a coherent set of beliefs throughout Western Europe. What a contrast to the modern world where globalization has exposed us all to a tremendous diversity of thought! We now have the freedom to sculpt our own beliefs from the rich heritage of many cultures. 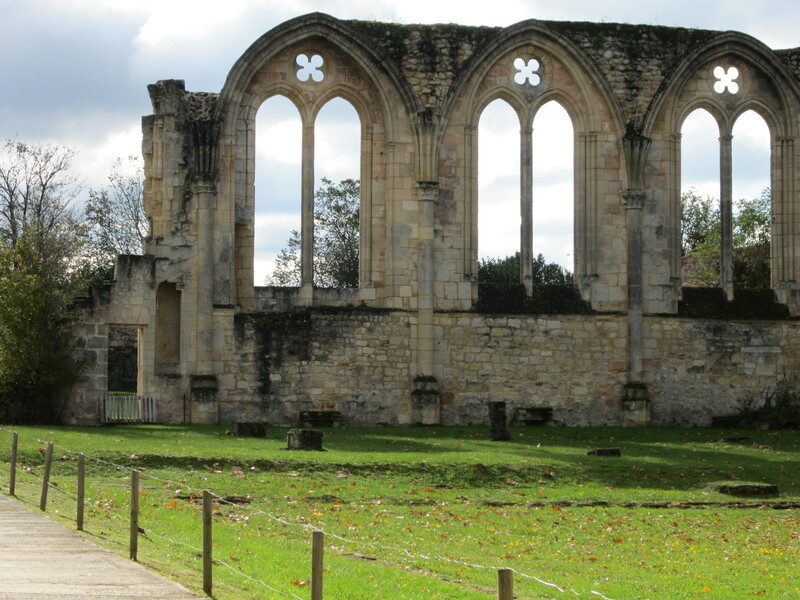 The beauty and relative isolation of the abbey created such an atmosphere of calm that we immediately slowed our pace. One could almost sense the sacred aromas of incense and candle wax in the now open to the sky nave. Faint chants of liturgical music played in my imagination. Wandering the grass-covered paths among the half-destroyed walls and arcades, we could picture the brown-robed monks and travel-stained pilgrims who thronged the site in medieval times. A bustling place then, today it is an evocative oasis of peace and tranquility. After a short walk through the museum to view the artifacts excavated from the ruins, we returned to the Maison des Vins. We purchased just enough bottles of Entre-deux-Mers white wine for the next phase of our journey through southern France. In the morning, we’d be leaving for the Dordogne region and a week at a rental cottage in the tiny village of Le Mustier. But for now, we were eager to return to Château de Crécy as we anticipated another delicious dinner. Maison des Vins de l’Entre-deux-Mers 4, Rue de l’Abbaye BP 6-33670 La Sauve-Majeure. Tel. +33 (0) 5 57 34 32 12. Abbaye de La Sauve-Majeure, 33670 La Sauve-Majeure. Tel. +33 (0) 5 56 23 01 55. I'm a mid-life writer and artist with a yen to see as much of the world as possible. Most of my travel has been in the US and Europe, but this year I'm planning a trip to Australia and New Zealand. After that? A river journey in Southeast Asia? Circumnavigation of South America? Or back to the UK and a ramble through Cornwall? Stay tuned. This entry was posted in Rambles in the French Countryside and tagged Abbaye de La Sauve-Majeure, Santiago de Compostela, UNESCO World Heritage site. Bookmark the permalink.